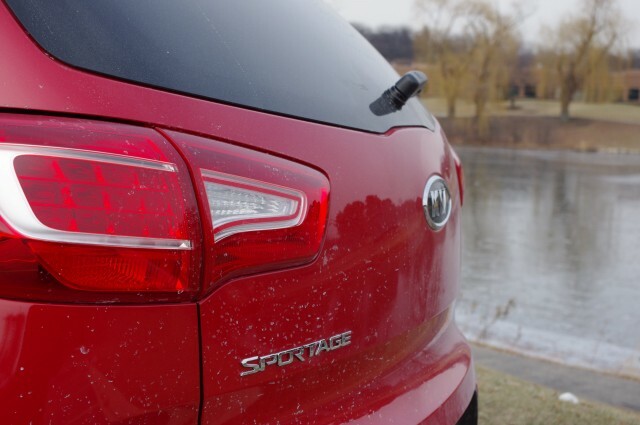 Kia's Sportage spec sheet is loaded with abbreviations: AWD, ABS, TCS, ESC, DBC, HAC, and ROPS. The latter letters stand for rollover protection system. It's just one of the numerous extras packed into the all-wheel-drive EX with navigation system, leather trim, panoramic sunroof, rear sonar and spiffy 18-inch alloy wheels. 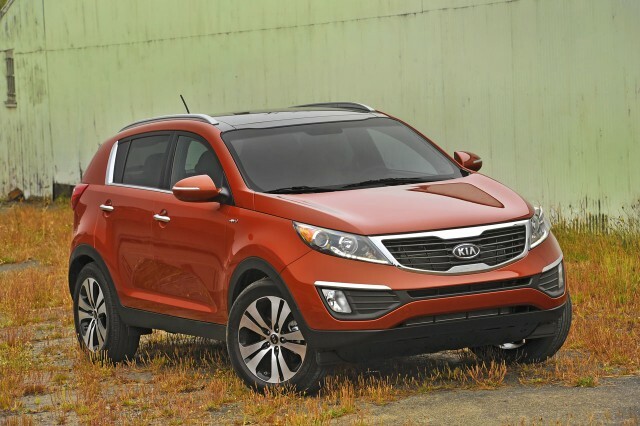 Unlike the outgoing Sportage, this one has a unibody platform shared with its corporate cousin the Hyundai Tucson. It's powered by a raspy 2.4-liter in-line four teamed to a hurry-to-top-gear six-speed automatic. 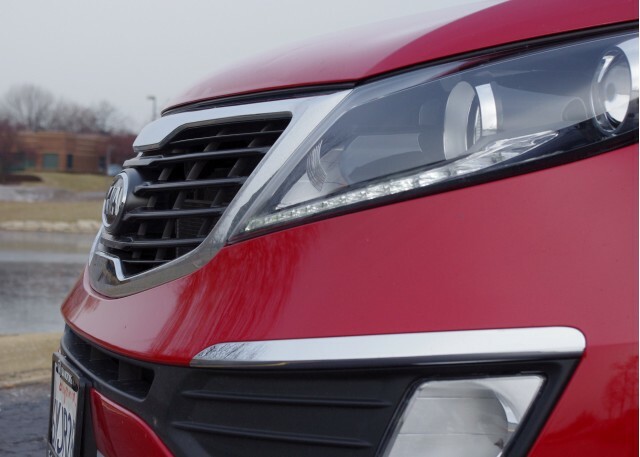 In at least one way, the Sportage delivers sport-rigid ride quality. There's steering effort and moderate body roll. Although highly maneuverable, this Kia's motor-driven power steering says, "artificially flavored." It feels better than the two-wheel-drive Hyundai Tucson, however. With more feedback, one might enjoy this machine's quick reflexes. It held its own on frost-heaved pavement, though. 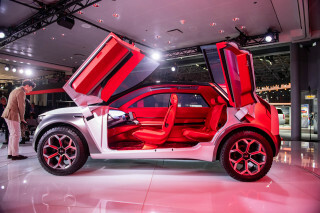 Onlookers gave this CUV rave reviews. 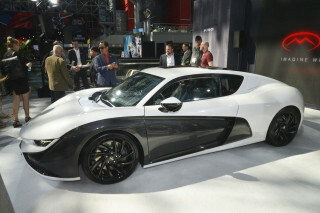 They liked its stylish contours, dazzling accents and Audi-like LED front lighting. It certainly makes a sophisticated fashion statement--a muscular stance with bulging tail lamps. On the go, the Sportage's mill drones due to an automatic transmission that's seeking ECO. There's a ‘manumatic' mode that lets the engine rev higher and produces a brisker motoring. Leave it in "D" and you are aware that this rig must downshift when trekking modest interstate loops. There simply aren't enough beans to pull this off. Roll at escape speed on Chicago's toll roads, might surprise you: it keeps up with the Jones in their Jaguars. Wind noise and mechanical din, however, mask its premium audio system's output. Quirks: stiff-to-adjust steering wheel, tight rear headroom (courtesy the twin-glass roof panels), blunt but barely high enough opening rear lid, and voice-operated navigation setup that requires a tutor. Heated sets have two settings: hot and hotter. You can also chill the driver's side too. Doorsills are wide. All who board must take a big step. Long-foot driver's right shoes snag the brake pedal's arm while stabbing the throttle. I eked out 23 mpg overall. EPA numbers: 21 mph city and 28 highway. Neat tricks: a spare tire inside the rear hold, nicely fitted floor mats and a roll-out luggage cover. Thoughtful. With a fresh Kabuki face and useful all-wheel-drive traction aided by an alphabet of mobility aids such as downhill and hill-start brake assist, Kia demonstrates that aims to hit the major players where it hurts.